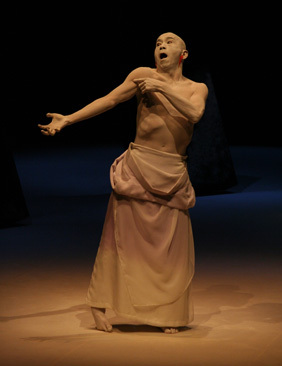 Butoh originated in Japan with a performance called Kinjiki by Tatsumi Hijikata in 1959. It was originally named 'ankoku butoh' or 'dance of utter darkness', as Hijikata tried to distinguish his new dance. It was later shortened to Butoh and drew in the work of a number of other artists. Butoh was throwing off the constraints of Western dance and the rigidity of the highly codified Japanese traditions such as the ancient Noh drama and Nihon Buyo (Japanese classical dance). While butoh was born out of a rejection of western dance, there are pedagogical links between butoh's founders and German Expressionist dance. Hijikata also drew on the writings of Jean Genet and Antonin Artaud, among others. The contradictions within butoh are part of what make it fascinating. Founders, Tatsumi Hijikata and Kazuo Ohno, were both trained dancers, and butoh certainly grew from a dance context, but like so much other work celebrated at Sadler's Wells, hybrid fusions with theatre or with visual art have enriched and broadened the scope of the artform. Sankai Juku's work is as famous for the sublime design as it is for the incredible training and expertise in their bodies and the choreography. Butoh has had a number of very distinctive periods throughout its history, which makes a brief history very difficult. The wild rebellion and improvisation of the sixties gave way to a focus on transformational forms in the '70s, and by the '80s, a number of very distinctive artists and approaches were established. Some were highly theatrical, others were pure dance and more abstract, while still others were site-specific improvisations. Butoh has now been transported all around the world, finding fertile soil in which to thrive and evolve in Europe as well as the USA and most other continents of the world. Ariodone (Ko Murobushi, Carlotta Ikeda and Yumiko Yoshioka) were first to perform in Paris in the late '70s. Sankai Juku were invited to France in 1980 and found a warm reception for their beautiful, sculptural and metaphysical works. 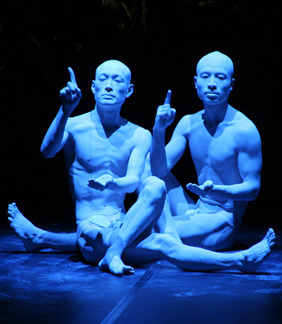 Their international touring would soon help butoh to reach ever wider and larger audiences. So what traits might we consider to be 'butoh'? A definitive description would never satisfy the breadth of artists involved in it, but a few recurrent themes are useful by way of introduction. Butoh is an attempt to uncover the dance that already exists, it must emerge from within, and not be imposed from without. Butoh uses 'reduction' to great effect, for example, stillness and slow motion are well known to audiences of Butoh. Done well, highly charged stillness and very embodied slow motion can heighten the awareness of the dancer and their audience to the detail of movement, and it can explore timeframes beyond the everyday. Reduction or distillation heightens presence, though stillness and slow motion themselves do not account for the absolute presence associated with butoh. Often observed as a kind of 'trance', it is more accurate to say the butoh dancer is in a state of 'hyper-presence', aware of everything going on around them and within their own body. The fact that butoh dancers often seem 'other' than themselves is the result of their skills in transformation. The two original founders of butoh, Kazuo Ohno and Tatsumi Hijikata offer seemingly contradictory advice on the process of transformation. Ohno might say, 'find the spirit, and form will take care of itself'. Hijikata might say, 'find the architecture of the cat, and the spirit will enter'. They approach the same point from different perspectives. Another distinctive aspect of transformation in butoh is that performers don't necessarily use only human characters as a source. Equally ready to explore transforming into a stone or a wet rug the butoh dancer draws on the full range of textures available in the natural world and attempt to manifest those physical and psychic materials in their bodies. Yoko Ashikawa, one of the earliest female exponents of butoh, danced a tree enduring the changing seasons. For the audience though, her body can become an old woman or their grandmother reliving all of life's experiences. To think of an old woman is not necessarily the best way to transform into old woman. Cultivating a highly receptive or responsive body, open to both external and internal stimulus is the crucial basis for transformation. A wave passing through the spine and limbs will reveal physical resistances, and in repetition can develop greater receptivity to being moved by that wave. In butoh is often said, 'the dancer should not dance, but be danced'. Ultimately the test of a great butoh dancer is their ability to transform not only their body but also the space, as their 'spirit' can only be accessed by the audience when manifested in the space. The butoh dancer carves an incredibly potent space between them and their audience. Drawing on the worlds of the unconscious, dreams and the irrational, butoh leaves space for the audience to bring their own thoughts and dreams to the work, offering a rich, metaphorical world to taste and to enter.